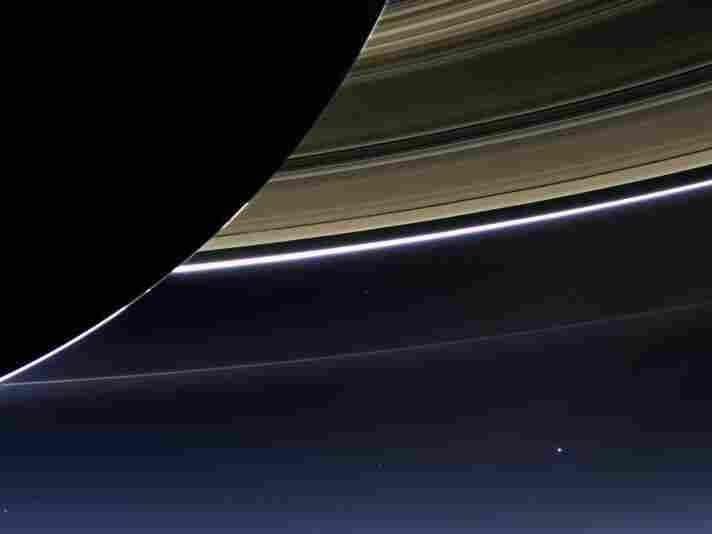 LOOK: Cassini's Version Of 'The Pale Blue Dot' : The Two-Way In a stunning photograph taken by the NASA spacecraft, Earth is seen alongside Saturn's rings. It's a photograph reminiscent of the image taken in 1990 by NASA's Voyager 1 spacecraft. Cassini — the NASA spacecraft orbiting Saturn — has beamed back a picture of what Earth looks like from its perspective. "[The photograph] is only one footprint in a mosaic of 33 footprints covering the entire Saturn ring system (including Saturn itself). At each footprint, images were taken in different spectral filters for a total of 323 images: some were taken for scientific purposes and some to produce a natural color mosaic. This is the only wide-angle footprint that has the Earth-moon system in it. "The dark side of Saturn, its bright limb, the main rings, the F ring, and the G and E rings are clearly seen; the limb of Saturn and the F ring are overexposed. The 'breaks' in the brightness of Saturn's limb are due to the shadows of the rings on the globe of Saturn, preventing sunlight from shining through the atmosphere in those regions. The E and G rings have been brightened for better visibility." As Mark reported, Cassini — which is 898 million miles away — took the photographs July 19. In a lot of ways, this photograph is a more artistic version of the "Pale Blue Dot" photograph taken in 1990 by NASA's Voyager 1 spacecraft. "Look again at that dot. That's here. That's home. That's us. On it everyone you love, everyone you know, everyone you ever heard of, every human being who ever was, lived out their lives. The aggregate of our joy and suffering, thousands of confident religions, ideologies, and economic doctrines, every hunter and forager, every hero and coward, every creator and destroyer of civilization, every king and peasant, every young couple in love, every mother and father, hopeful child, inventor and explorer, every teacher of morals, every corrupt politician, every 'superstar,' every 'supreme leader,' every saint and sinner in the history of our species lived there — on a mote of dust suspended in a sunbeam."